Healthcare REITs outperformed the broad REIT index and S&P 500 in the fourth quarter 2018, a period of great volatility when equity markets fell 20% at one point. 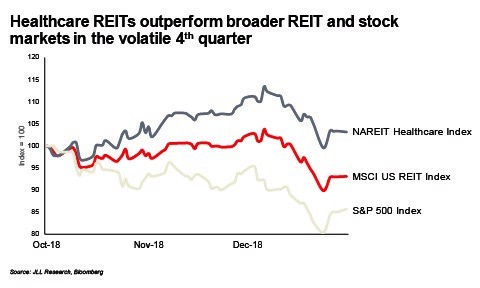 The NAREIT Healthcare Index closed the year up 3% from the start of the quarter with the S&P 500 ending down 14% and the broad REIT index off 7%. Healthcare’s positive share movement is linked closely to the movement in U.S. Treasury yields; with 10-year rates declining from 3.05% to 2.68% during the quarter, investor appetite for returns from healthcare REITs grows. The performance of the healthcare sector’s real estate offerings is a clear reflection that the growing demand for healthcare and long-term care is largely independent of the economy. 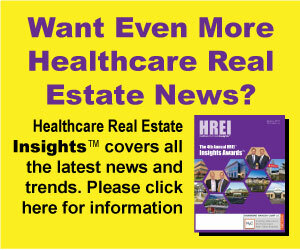 Healthcare real estate features long-term leases with predictable income from service providers fulfilling critical medical needs that continue even in an otherwise unpredictable market. REITs such as Welltower have taken advantage of their buying power during this period, announcing sizeable acquisitions including the $1.25 billion CNL medical office portfolio with 55 buildings totaling 3.3 million square feet as well as more than $500 million of strategic medical office investments. Healthcare REITs are using more ingenuity to stay in the game for acquisitions through strategic joint ventures. HCP formed a $605 million joint venture with Morgan Stanley in August 2018 for a 2 million square foot medical office portfolio which included the acquisition of 16 buildings totaling 856,000 s.f. leased to Greenville Health, acquired from Healthcare Trust of America. Healthcare REITs vie for strategic health system relationships to develop critical scale and future investment and development opportunities with market-leading providers. While private equity dominated healthcare competitively through much of 2018 as REIT share values lost ground with the rise in U.S. Treasury yields, the fourth quarter is a reminder of how quickly the table can re-set. The disciplined strategies of certain healthcare REITs and the surplus of capital chasing healthcare properties today is testimony to the durability of this relatively stable property class. With economic and market uncertainty, the reliable cash flows of healthcare properties supported by the steady forces of a growing and aging population, make this sector a strong defensive play in today’s market.